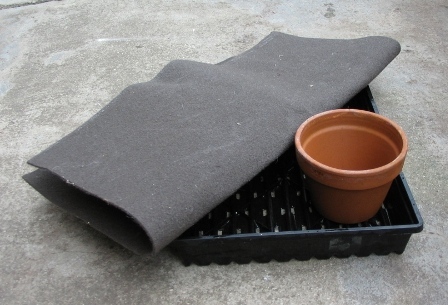 This is a quick and easy project to construct a self-watering capillary tray. It’s basically a tray with its own water supply, that you sit your pots in, and it automatically waters them for you. All you have to do is occasionally top up the main water reservoir, that’s all! They’re great for seedlings, freshly rooted cuttings, and anything else that needs constant moisture. This simple but effective device works by the principle of wicking, as explained below. 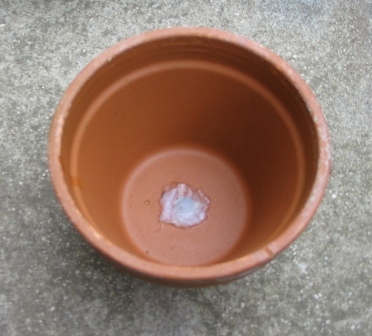 In this setup, a terracotta pot (with its drain hole sealed) is used as a water reservoir. Beside it sits a plant in a pot. Both are sitting on capillary matting which absorbs water. The terracotta pot slowly oozes water out onto the capillary matting. The capillary matting, a synthetic absorbent material, soaks up water like a sponge. 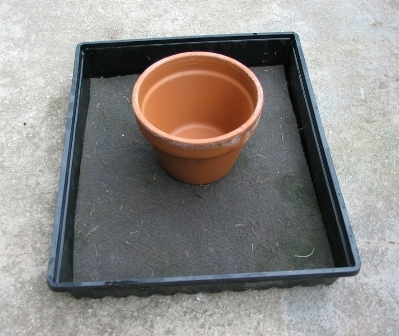 The moist potting soil in the plant’s pot wicks up water from the damp capillary matting. Now, some basic science. A property of water it that it sticks to itself – this property is called cohesion. It’s easy to understand when you consider that if you put two drops of water next to each other and push them together, they become one big drop! Similarly to the way that small drops of water join up to make a bigger one, what happens here is that the water in the potting mix connects to the water in the capillary mat which connects to the water in the terracotta pot, and all three objects act like one big wick, drawing an even amount of water across themselves, and maintaining it as long as there’s water in the terracotta pot to draw from. So, when the plant draws up the water in the potting mix or it dries out from evaporation, water will wick back into it to restore the moisture lost, so our plant gets its water supply and stays a happy plant, which is the way we prefer to keep them! The first thing you will need is a plastic tray with drainage holes in it to hold the whole thing together. 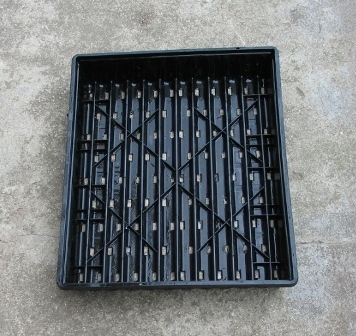 Pictured below is a seed punnet tray that is used commercially in nurseries. Any plastic tray with drainage will work. The next important piece is the capillary matting. It’s a grey synthetic fabric about 5mm thick that doesn’t rot from constant moisture. You can probably find it at places that sell greenhouse or hydroponic supplies. I’m guessing you can most likely use any absorbent material, maybe even newspaper (which will eventually degrade, but who cares, its recyclable), but I haven’t tried it yet, so if you’re keen to experiment, give it a go and send me some feedback! The third component required, a small terracotta pot, the one used here is a 5" (13cm) wide pot. A small terracotta pot, size is not too critical in this application, it just has to hold enough water! Seal the drain hole in the terracotta pot with silicone sealant (or by any other means) so it holds water and does not leak, and allow it to harden. Terracotta pot with drainage hole sealed with silicone sealant. 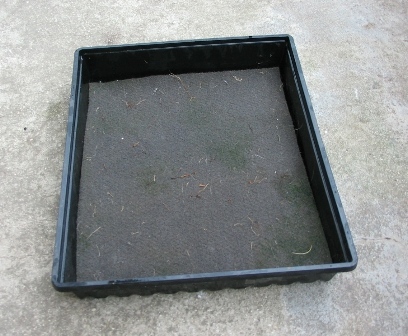 Cut the capillary matting to size so that it fits neatly into the bottom of the plastic tray. When the silicone sealant has dried properly, you’re ready to set the watering treay up. Place the terracotta pot in the centre of the tray. This ensures an even level of moisture all around the tray. Best to move this setup to its final location at this point, as it may get too heavy or delicate to move, once the water and plants are put in. A sheletered location with part shade or dappled sunlight is recommended as you don’t want your delicate plants exposed to full sun or wind. The water won’t last as long either! Place as many plants as you want around the terracotta pot. 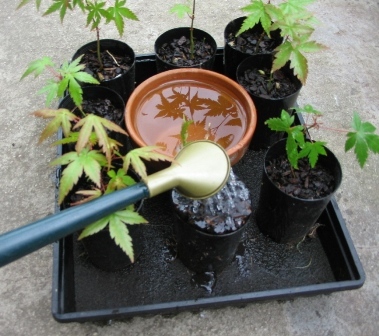 Fill the terracotta pot with water. Water each of the plants so some excess water runs from the bottoms of the pots onto the capillary matting to establish the wicking into the potting soil. All complete, a well watered collection of plants. Now, just top up the terracotta pot and it will do the rest. If the terracotta pot accidentally runs dry, re-fill it with water and re-water the individual plant pots to re-establish the wicking. This can be scaled up in size too without any problems. this is another setup I have which is almost twice as large, approximately 1.5′ x 2′ in size, which has been in place for a few months. It’s located on the east side near a fence where it gets a bit of morning sun, and dappled or indirect light around noon. This is where I put small seedlings and freshly rooted cuttings to keep them safe from drying out, and to establish them a bit further till they are ready to plant. This system of watering, which is essentially what is termed "sub-irrigation" (watering plants from the bottom up), also allows seedlings to develop strong root systems, which make them much stronger when they are planted out in the garden later on. Since the moisture wicks up from the bottom, and the plants roots will grow towards the source of moisture, the seedlings develop a deep, strong and extensive root system. Be careful because they will grow really well, and will set roots into the capillary matting! 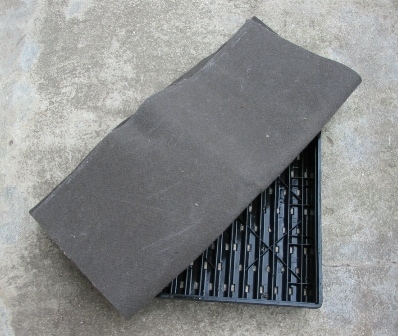 You can add a sheet of root control matting over the capillary matting if you want to avoid the plants rooting into it, and the retailers that sell capillary matting also sell the root control mat . Also, if you really want to give the seedlings and extra boost, you can add a nutrients or fertilizers to the water in the pot. In keeping it all organic, I’d recommend trying things like seaweed extract, worm casting liquid, or compost tea. You’ll be surprised at the accelerated growth rate due to the supply of constant moisture and nutrients! It will be bit like leaving a damp sponge sitting on the spot where the tray is located. Even though there is a small air gap, the humidity is high below the tray and you do get a lot of moisture building up. There’s a simple solution if you want to protect the surface below. The seed punnet trays are also sold as the bases for small plastic propagators (with a clear plastic lid to grow seedlings in), and you can buy separate plastic drip trays that fit these. Put one underneath, and it doesn’t matter if you accidentally spill any water when filling the water reservoir pot. Hope this helps! 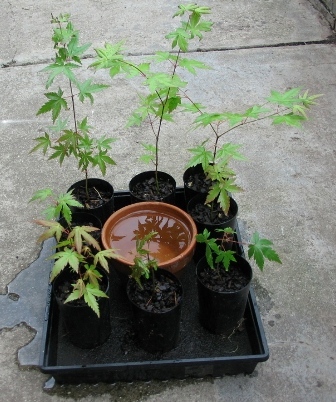 At the moment I am filling the tray the pots are in but I like the idea of using the terracotta pot as a reservoir. Now to track down some capillary matting. Thanks for this post. Very helpful and interesting. Hi! Thank you for sharing this technique. So… The center pot is unglazed, non-draining terra cotta. Okay… Got that. Are the little outer black pots in your photo made of plastic? Do they have drainage holes? Could they be drainage-holed terra cotta? One other thing… Is the tray really drainage-holed too? I’m sorry, but that just doesn’t make sense to me. I’d think that either we’d want the water to hang out in the tray until it can be soaked up, or we’d expect there to be no excess water because it’s all contained in the absorbo mat, thus negating the need for drainage holes. Looks like I got a little carried away here. Sorry about that. I’m thinking about starting a collection of mini or micro mini african violets. They grow best with sub whatever watering, as they don’t like their leaves to get wet. The pots I’ve placed in the self-watering tray are regular, off-the-shelf small black plastic pots with holes underneath. You can place any pots in the tray as long as the water can wick upwards. I use all manner of pots in these trays. Even pots with side holes work as some of the soil spills out and creates a bridge for the water to wick into the pots. Either way, the plants roots will find their way to wet capillary matting and take hold! You can use another horticultural fabric, root control matting, over the top of the capillary matting if you want to limit this. 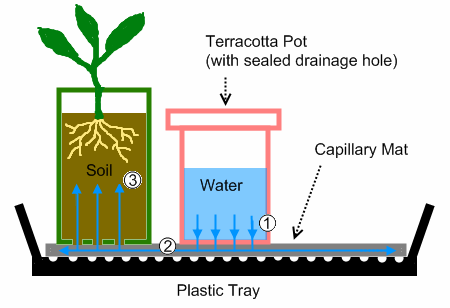 You can use any pots that have drainage holes for the plants you intend to water, and teracotta ones would work great. 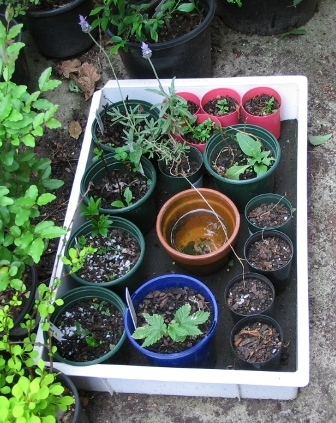 The tray underneath has drainage for a simple reason, my trays live outside, out in the open. When it rains, the capillary matting stays wet and maintains the same level of moisture, the terracotta pots fill up with fresh water, but the plants don’t end up swimming knee deep in a tray of water. Must say though, brilliant idea to use it as a sub-irrigation system for african violets. Obviously, african violets live indoors, so you wouldn’t want the moisture from the capillary matting seeping down though a tray with drainage, you’re abdsolutely correct, you would use a watertight tray to retain the water. I’ve never thought to use it as an indoor system, and I think it’s a great idea. I’ve got some african violets indoors, and it’s a tricky watering them without wetting the leaves, and since I do have trays that don’t have drainage holes in them, I’m going to give this a go! Thanks for a great idea that extends the flexibility of this design! good, very simple and sensible. I would cover the free standing water as mosquitos especially the Tiger mosquitos will have a field day. Hi Brian, I use a completely natural solution to stop the mosquitos – just drop in some duckweed. Within a week it creates a thick floating layer that slows evaporation, and totally blankets out the mosquitos. I discovered this by accident when I dropped some duckweed from my water garden into one of the pots without realising it! Hi, I am just setting up a small greenhouse (from an old window) and I have been thinking about how I can propagate seeds using a wicking method. I came across this post and am inspired to give it a try. First I just wanted to hear if anyone has had successful germination from seeds this way? Or any thoughts on starting off with seeds? Was thinking it might be possible putting a heating mat under it too for cold nights. Any thoughts? The setup you’re describing is what commercial production nurseries use to grow seedlings, a greenhouse with capillary mat sub-irrigation and bottom heat. I would avoid natural fiber materials, they will rot quicker. The quickest capillary mat would be one of the reusable bags — walmart has them for 50c per. I would avoid red unless you’re growing tomatoes in this type system in larger containers – -the reflection of the red light waves is apparently helpful to tomato plant growth and production (I grow my tomatoes in the ground and haven’t been able to find red landscape fabric or permeable plastic. Thank you for the helpful article, really cleared up a few things for me. Although I do have one question. How does the water get from the reservoir pot to the spongey material if the access/drainage hole to it is blocked by sealant or something else? I get the feeling I’m missing something incredibly basic here but could you clarify anyway please? The missing bit you mention is simple fact that terracotta is actually porous, it will hold water, but it slowly seeps through. You must use plain teracotta, if the pot is glazed it wont work. That’s why a lot of earthenware is used in the kitchen is glazed, so the water doesn’t weep through. Hope that helps. I was just wondering, if this method was used for germination and seedlings. Would the constant wet/damp conditions cause damping off, root rot, or rotted seed (I’m not sure which one applies but I think there all genuine problems)? Can you tell I’m a novice! Ahh thank you very much for the reply, I was completely stumped there. I had no idea terracotta was porous, again thank you for the reply and the very informative article. First great informative article. I am thinking about setting up a small greenhouse for a project for my sunday school kids age 8 and 9. Since we would only be in the class once a week I was worried about watering throughout the week. So this helped me a lot. Do you have any suggestions on easy flowers and plants to grow? Thanks Mary, I’m assuming you’ll be growing plants in fairly small pots, and not being sure of your climate, even in a greenhouse, a few easy to grow plants that you might like to try are things like strawberries, peppermint, spearmint, lettuce, spinach, thyme, chives,lamb’s ears, violas, violets, small daisies. Succulents are also very hardy and would be survive well with only weekly watering. Thanks for the info I think well use the violas and daisies. I use a old towel as my capillary mat and it works great. Any cotton will do. Thanks for this. I had previously tried sealed bottom trays & tubs with an inch of sand in the bottom that I bedded my pots into and from there I watered the sand. Growth was fine and I never let the sand dry out though it was a tad heavy on my green house shelves, got my Melbourne late winter seedlings off to a great start. This year I repeated it without the sand (had none at the time) and left about 10mm of water free in the bottom of the tubs, no root rot issues and the tomato and sunflower roots grew into the water and were very happy, as are my grape seeds/seedlings, basil, & celery. Next I’ll try a hybrid of your unsealed pot idea with an inch or so of sand. What materials are good for the capillary mat? Anything that wicks water will do. If you want it to last a while, something that won’t rot too quickly as well. This might sound like a dumb question but how does the water drain from pot to matting? Trying to setup this up before I go out of town for my seedlings. Thanks for any info! All plain (unglazed and unpainted) terracotta clay is porous, it weeps water slowly through its surface. I’m so happy to see that this is a current post. I am attempting using grow bags for tomatoes this year, as they don’t get enough sunlight in my garden. My plan was to put them in a tray and maintain a small amount of water and have the bag serve as the wicking material. Does this sound like it would work? I’m in California and don’t have to worry about rain in the summer. If this approach works, any ideas about an affordable large tray? I’ve been looking at boot trays, which still are not very cheap as I need three of them for six plants. If I want to use the terra cotta pot method, then I’d need wicking material as well, right? I assume I can use a larger pot if I want the water to last longer, right? If the bags will be sitting in a tray of water, you’ll need to be careful not to waterlog the potting medium and rot the roots. 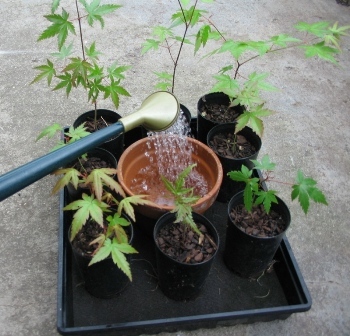 Most plants need a wet-dry cycle, so you’ll need to let the water dry out for a while before you top up the water level if that’s what you intend to do. If you want to set up a large scale version of this project, yes, you can just use a larger terracotta pot, and you’ll need to use some kind of wicking material to sit the plants on. I would NOT say you want a wet-dry with tomatoes. That’s how the skins split and you get diseases or ruined fruit. Even watering that’s why this, and the RGGS works (check out Larry Hall videos on YouTube and his FB page, Rain Gutter Grow Systems. Check out the construction materials section of your home centre, they may have some larger plastic trays, or a kiddie pool on sale will work too. (That’s the foundation of the first version of RGGS developed by Mr. Hall, it used rigid plastic kiddie pools with the non-woven reusable grocery bags placed inside, holes drilled about 2″ up from the bottom to ensure that the water doesn’t overwhelm the bagged plants, and you can add gravel to the water to be a bit higher than the level, to discourage mosquito growth and reproduction. Hi Heather, this system is for growing seedlings and cuttings to provide them with a controlled and steady amount of moisture, not for growing full sized fruiting tomato plants! What I mean by all plants (except aquatic plants) needing a wet-dry cycle, is that they go from damp to almost dry, the water moving through the soil carries air down into the roots, which all plants need. I don’t mean going from waterlogged to bone dry, both are bad for plants – too much water and roots suffocate, no water and roots die. Horticultural supplies stores and hydroponics shops are your best bet, it’s used for plant propagation to water pots from below. I was wondering, do you have a recommended method for larger plants, such as full sized fruiting tomato plants? I love the idea of constant water and nutrients, but I’m afraid of water-logging the plants, or not getting enough water to them. I’d be using 10-15 gallon pots most likely. What about for the fabric pots, like Smart Pots? I’m very interested in those but I’m not sure they could properly be used with this sort of method. For large plants such as tomatoes, you can purchase or build your own self watering pots, which have a water reservoir underneath, the water is wicked up into the soil above it to provide constant moisture. I’ll have to write an article on how to build those too! In UK hozelock do a plastic reservoir system that has spikes with cloth wicks that puncture the grow bag from underneath. The reservoir holds enough water for a week or more depending on the size of the tomato plants. I’d like some guidance about how to use the fabric pots. I tried following the Larry Hall videos, but I didn’t see any watering instructions. My plants took off initially, but I ended up drowning them. It’s interesting that an over-watered tomato plant looks the same as an under-watered plant. My setup is a tomato plant in a walmart bag in a plastic tub that’s a bit bigger than the bag. I am trying an inverted bottle of water as in a chicken drinker as a water dispenser. I believe this method will allow the right amount of water to keep the water level in the mat. The rate of water oozing out from the terracotta pot might be too slow. However practically it might be sufficient. I am also trying a plastic sheet placed in a one inch deep and ten foot long sand filled groove in the garden with the four edges of the plastic sheet folded up to hold water as a long capillary mat. The inverted bottle of water is retained to dispense the water required to keep the level of water in the groove. 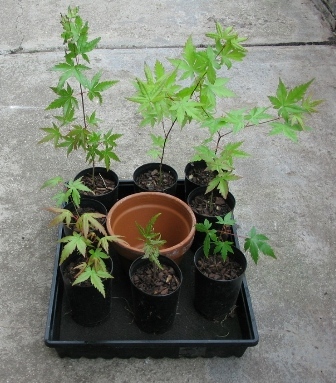 This arrangement can cater for a larger number of pots. May I ask if mosquito larvae can form on the capillary matting? I’ve tried this method by using different kinds of material, since I couldn’t find capillary matting in our country. And I noticed that small pools of water form in some parts of the capillary mattings that I’ve used. Will this attract mosquitos? Thank you very much for your help. Water can’t pool in capillary matting, it’s porous and wicks the water very slowly! Try using old hessian sacks or newspaper for capillary matting material. could you tell me how well this will work in very hot dry conditions? full sun in temps over 100 and low relative humidity. this is a condition I found myself in last year and I lost most of my plants. Yes it will work in hot conditions, if the weather is really extreme, cover the plants with 50% shade cloth as well. Do you think that a layer of coco fiber would work as a capillary mat? If it absorbs and wicks water, it will work. Please feel free to experiment and let us know how it goes! Forgive me for being stupid but if you seal the hole in the terracotta pot, how does its water get out into the matting!?!? It’s a valid question – all unglazed terracotta is porous and if you make a container that holds water out of it, it weeps water slowly through the walls of the container. Hi how does water from the sealed pot be available to the capillary matting? Terracotta clay pots are porous and water will very slowly wick through them. The medium to large clothes that retain a great deal of water (Used to dry off a vehicle after washing) make good wicking. In fact after reading this sites info I plan to experiment and see if a few clothes will make both the planters wicking in reverse; In past I just cut a two to three inch strip of it and placed it into the bottom a planter. There long enough to reach up the interior of the pot and into a water container such as a two liter bottle. Slit the upper two liter bottle from the treads straight down just a few inches. Pack in the towel with a tube to refill the two litter. Push together, duct tape it where it’s cut, and replace the cap. If the plant is already established just lightly push the cut cloth strip around the inner edges of the plants container. Tie one strip to the next if length is needed. Go to the beach and no worries if it’s dry times. Enough water will flow for even daily moist soil. ( I think this material would work for same or very similar set up as you show here)! !